Reaching the highest peaks has its rewards, including stunning views and picturesque sights. But if you want to reap the perks, it's imperative that you maintain your safety and health on your climb to the top. Whether you're trekking up Kilimanjaro or scaling the Rocky Mountains, you must get your body acclimated to the altitude, and for that, you'll need a few high-altitude hiking tips. 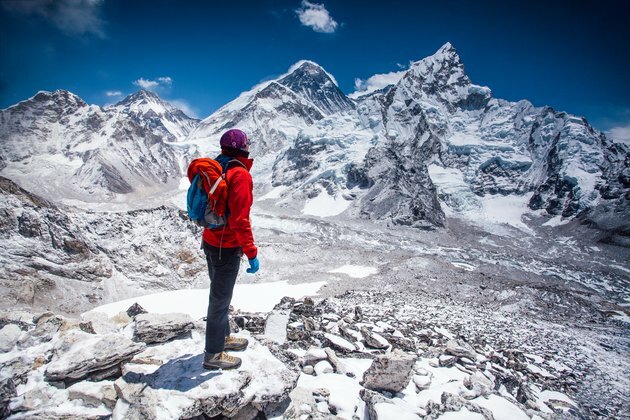 The first order of business while you're training for altitude trekking: Get in shape. An article published by Kilimanjaro Trek Guide recommends strengthening the cardio-vascular system through aerobic training exercises. The article also suggests light- to moderate-intensity training exercises like long-distance running, swimming and cycling. You can start your training about two to three months before the climb, exercising three times a week for a period of 40 minutes to an hour each time. If you have easy access to a mountain, get your body acclimated to higher elevations. Start small and build up to higher altitudes. This will give you some idea of how your body will react to high altitudes. High-altitude hiking training requires the ultimate discipline when it comes to staying hydrated and getting the necessary amount of rest. Without fluids, you run the risk of becoming fatigued and more susceptible to altitude sickness. Your body will require more than the usual fluid intake during your climb, a minimum of approximately 3 to 4 quarts per day. Keeping that in mind, it's important for you to get your body accustomed to taking in large quantities of fluids. Hydration also plays a significant role in how much high-quality sleep you get, as dehydration can cause restless nights. As a general matter, people usually have trouble sleeping at high altitudes, so make sure you're well-rested before you start the big climb. Acute Mountain Sickness (AMS): a mild form of altitude sickness that may produce symptoms such as nausea, a headache or fatigue. High Altitude Pulmonary Edema (HAPE): a serious sickness (that requires medical attention) in which liquid gets into your lungs and it feels as if you've had the wind knocked out of you. Signs of HAPE include coughing up frothy foam. High Altitude Cerebral Edema (HACE): a life-threatening illness marked by confusion and incoordination that also requires immediate medical attention and descent from the mountain. Everyone's body reacts differently to high altitudes, so it's best to first test out your reactions by training at high altitudes. Then make sure to bring the proper provisions with you on your hike. Take along enough food and water, in addition to an altitude aid kit with medicine such as Diamox (often prescribed for hikers who are ascending above 8,000 feet), ibuprofen, cough drops and indigestion medication.